It’s that time of the year to celebrate poetry. I do enjoy poetry but tend to stick with poets I love so for me this month is a good reminder to explore new poets. Austin International Poetry Festival – This event is being hosted by the fabulous Bookwoman Bookstore. Social advocacy/social justice is one of several themes interwoven into this festival. Typewriter Rodeo at Austin Book Arts Center. Give the poets a topic and they’ll whip up a poem on a vintage typewriter. Plus, there’ll even be a bit of bookbinding going on! Poets Resist: The First 100 Days at Malvern Books. Join local poets for readings and discussion as they gather to voice their concerns regarding the first 100 days of the Trump Presidency. If you don’t have any events near you, there are many other ways for you to celebrate poetry. For example you can check out some a new poetry collections: 13 New Poetry Collections. I especially like, “Mary Wants to be a Superwoman”. Isn’t that a great title? 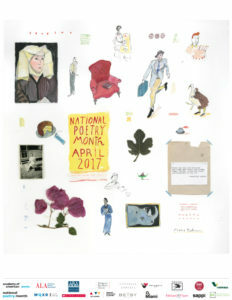 You can also go to Poets to sign up for a poem a day or check out their list of 30 additional ways to celebrate poetry. Last but definitely not least, Serena from Savvy Verse & Wit is hosting a poetry celebration on her blog. Lots of features, blog posts, and reviews focusing on poetry. So what do you say? Aren’t you ready to jump in and celebrate? Would love to hear if you are reading a new poet or if you are attending an event. Also, if you have a poem you love let me know what it is. I’d love to check it out. Typewriter Rodeo sounds like it would be so much fun! Stefanie – I know right? I don’t think I’ll be able to make it tomorrow but I must try to get to at least one poetry event! Tiffany – How fun! Isn’t that poster cool? I have one of the older versions which I would love to frame but just haven’t gotten around to it. I was just today thinking I need to read a poetry collection (or at least a few poems) in honor of Poetry Month! I am not a good poetry reader so it is all new to me. Thanks for the links–something to check out–perfect! I love that more poets across the country are hosting their own resistance efforts. And poets who can whip up a poem based on a random topic in a short period amaze me. I love those kinds of events. I love Jeannine Hall Gailey’s poems and Jessica Piazza, and Matthew Thorburn’s new collection, Dear Almost is beautiful in its sadness. There are so many great contemporary poets. I love Natalie Shapero’s poetry, and hadn’t realized her new book was out until I read the list of new volumes you linked to–thanks!